How does the Saluki Hunt? Many times the Saluki's hunting ability was all that stood between the Arab and starvation. The swift Saluki was used to run down fleet game such as hare, fox and various types of gazelle. The nature of the terrain dictated what they had to be physically; the nature of the hunt and the life style of the tribes dictated what they had to be mentally. In his native environment the Saluki gets no pampering. He lives hard, one reason for his strong constitution and sturdy frame. His feet are hard and firm, and the hair between the toes provides great protection. The brisket is deep and efficient like that of an athlete and their legs are strong yet light to provide speed. The saluki was bred to be a pack animal. From earliest times, they were kept in packs and often hunted in groups of 2-6. Since the salukis were always operating in the hunt without the direct supervision of their masters, it was vital that they have the intelligence and independence to do so successfully. These qualities were / are greatly valued (and bred for) by the Bedouins. Gazelle were often prey for the Saluki. 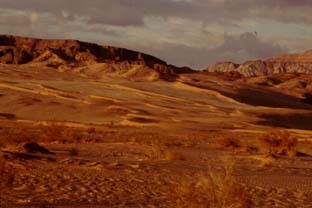 Tribal life in the desert also dictated several other requirements. The Bedouins prized their salukis highly, even allowing them to sleep in the masters' tents. So they did not want them stolen by rival tribes. Thus, they bred for an aloofness, a wariness with strangers, to protect against theft. Yet the hospitality of the Bedouins was legendary and their hounds could not be aggressive toward visitors and other members of the tribe. The result of this selective breeding and training is a hound who is at ease and affectionate with people he knows but aloof with strangers. The Bedouin also understood that their hounds could not be aggressive with other animals, since they had to live with other salukis and all manner of livestock. And so the Saluki prospered and as one civilization died and others were born, the saluki maintained their role as coursing hound and it is these events have brought him to us today. < Back to Main Index or read on . . .
At one time, the Saluki was carried on camel or horseback to keep him fresh for the chase. Arab hunters, on their mounts with a hawk on their wrist, and a saluki up before them, would go into the desert to hunt. At the selected area, the hawks would be sent out questing for game. 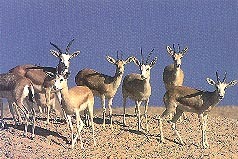 When the hawks found a herd of gazelle or oryx, they would circle high in the sky above the herd. The watching salukis were then freed and would race toward the location of the circling hawk, often miles from their starting position, while the hunters followed on their fleet horses or camels. The salukis would then single out their target and the chase would begin. Sometimes the chase was short and fast; but at other times, the chase lasted for many miles, testing the stamina and heart of the Salukis. Once the prey was caught, it was brought down by a firm grip on the animal's throat by the strong jaws of the saluki. In Islamic religious practice, the hound must not kill the prey; it must be ritually dispatched by the hunter for the meat to be consumed. The hounds were trained to hold the prey but not kill it. That death grip on the throat cut off oxygen and forced the prey into unconsciousness, awaiting the arrival of the hunter. If the hunt was for hares, and the hunter was on foot, the saluki would be trained to bring back to him the unmarked, unconscious hare. Salukis coursing a hare or gazelle must work together to turn the prey toward the strong jaws of the nearest hound.